The paper considers dynamic response identification method in mechanical vibration systems. Dynamic reactions between inertial-mass and connecting elements (springs and dampers) as well as reactions in contacts with bearing surfaces are determined on the basis of obtaining reduced rigidities. These parameters are determined during the transformation of structural models of initial design schemes. The approach under discussion is based on structural concept of mechanical vibration systems. They are transformed into corresponding structural schemes of automatic control systems. When you select an object for the constraint force calculation as the second-order integrator which corresponds to the object to protect in vibration-proof systems, for example, the feedback physically corresponds to the dynamic response. The examples are given. The technique for performing required changes and obtaining analytical relations for dynamic connection response determination is developed. Keywords: method of definition of dynamic reactions at vibration influences, vibroprotection systems, transfer functions. Vibration technology : a guide in 6 vols. Vol. 6. Protection against vibration and shock / ed. K.V. Frolov. – Moscow: Mashinostroenie, 1981. – 456 p.
Eliseev S.V., Khomenko A.P. The problem of vibration isolation and vibration technical objects in the works Irkutsk Mechanics School // Modern technologies. System analysis. Modelling, 2005, № 5. – P. 6-26 . Harris C.M., Piersol A.G. Shock and vibration Handbook. Fifth Edition. McGraw – Hill. New York, 2002. ISBN 0-07-137081-1. Eliseev S.V., Dimov A.V. Formalization describing relationships in complex systems, vibration isolation with additional elements // Modern technologies. System analysis. Modelling, 2004, № 3. – P. 10. Khomenko A.P., Eliseev S.V., Ermoshenko Y.V. Methodological basis for solving the problems of dynamics. Mechatronic approaches (Part I) // Modern technologies. System analysis. Modelling, 2012, № 4. – P. 1-20. Eliseev S.V., Dimov A.V. Some features of the structural representations of two-mass vibrating systems // Modern technologies. System analysis. Modelling, 2006, № 6. – P. 46-54. Belokobylskiy S.V., Eliseev S.V., Sitov I.S. Interaction through links mass-inertion element in the theory of mechanical chains // Systems. Methods. Technology, 2012, № 2. – P. 7-15. Eliseev S.V., Moscowskiy A.O., Bolshakov R.S., Savchenko A.A. 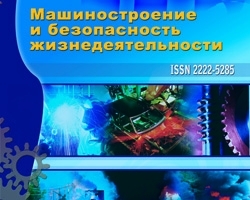 Integration capabilities methods of circuit theory and the theory of automatic control in the dynamics of machines // techomag.edu.ru: Science and education: e- Science technical publication, 2012, № 6. URL. http://technomag.edu.ru/doc/378699.html.